It was a Saturday afternoon and this American was at the mall. Nothing strange about that, right? Where it gets weird is that he was the only one at the mall. And I mean literally the only living creature on this giant plot of city-center property*. I wasn’t even there to buy anything! But that’s lucky, because believe me, there was nothing for sale–no novelty t-shirts, no shoes, no Spencer Gifts, no Licorice Pizza, and (sigh) no Orange Julius. 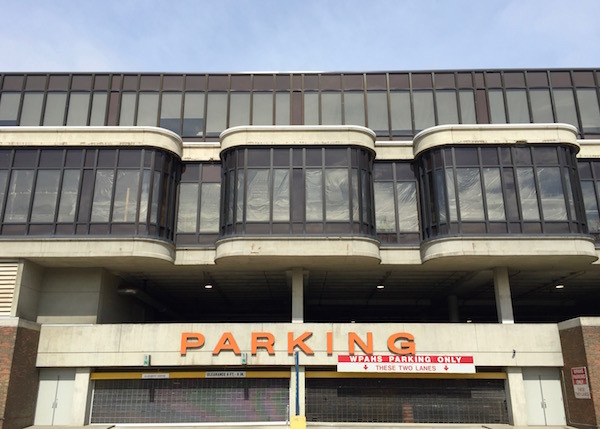 Allegheny Center, one of Pittsburgh’s three ginormous, well-intentioned, but ultimately disastrous urban redevelopment projects of the 1960s, is today the most intact of that triumvirate. The Civic Arena was torn down several years ago and its massive site is currently in development for yet another makeover. East Liberty’s business district is more gradually having its wrongs…undone (I’m not sure “righted” is fair–certainly the displaced residents wouldn’t think so). 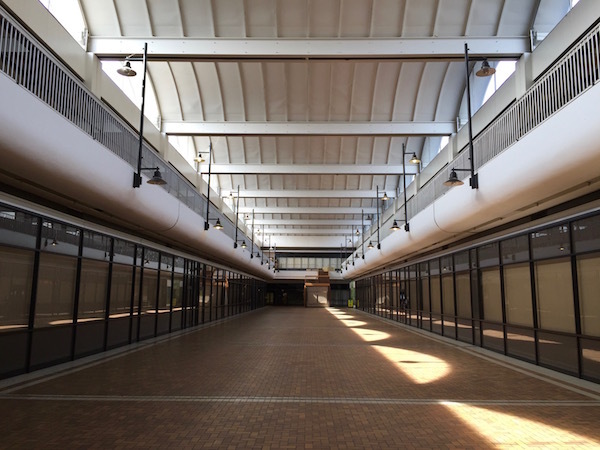 This isn’t your average dead mall. For one, it’s not way out in the suburbs–just one river crossing and a few blocks separate Allegheny Center from downtown Pittsburgh. For another, even though as a shopping mall it’s definitely long gone, some amount of the property is very much in use. Many of the former retail spaces are now occupied by an unlikely collection of anonymous back offices for banks, utilities, tech companies, etc. There’s even a working soup-and-sandwich restaurant to serve the captive clientele (but it’s not open over the weekend). 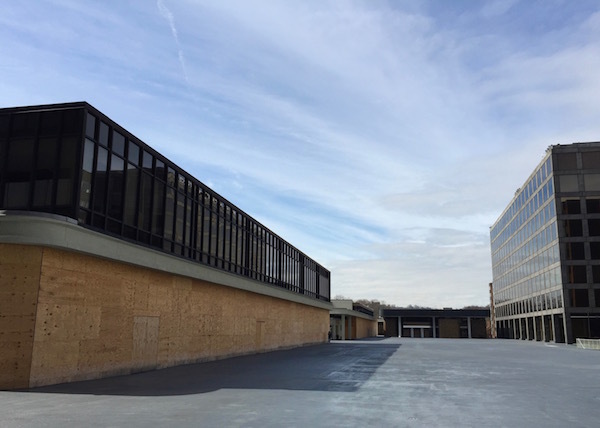 Things are going to change fast for Allegheny Center real soon. Announced last year, the complex is about to have a whole bunch of money dumped into it to convert the mall space to a incubator and campus for high tech companies with the new name Nova Place. Radiant Hall has moved into the ground floor of the office building and Quantum Theatre will stage its next production (Ibsen’s The Master Builder) upstairs in April. We thought The Orbit ought to get in there and take a look before everything changes once again. Allegheny Center isn’t just a (former) shopping mall. It’s a small complex of buildings that includes an eight-story office building and a similarly-sized set of apartments (which may still be in use). There’s also a terrific freestanding bank branch that has the center’s very of-its-time midcentury modern curved boxes. Much has been made about what The North Side lost when the Allegheny Center project came in–most notably its beautiful, central market house and sensible street grid. That was all before this blogger’s time, but the pictures are heartbreaking. 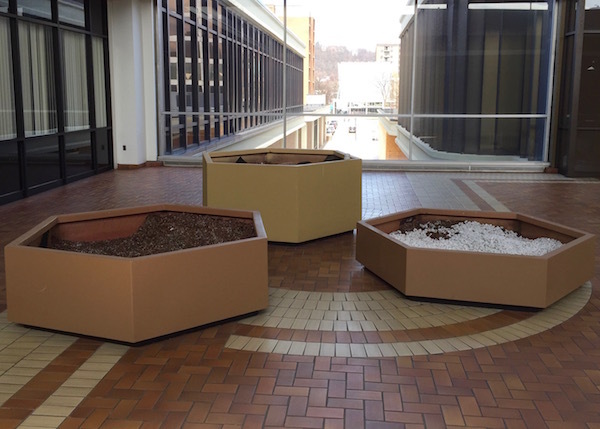 That said, the fifty years that have passed since Allegheny Center was built in 1966 have largely been kind to what could have been a horrific featureless and windowless box like many of its enclosed mall peers. The overall design is an inventive mixture of interior and exterior space. Shoppers could get to destinations both within the enclosed mall area and also from a number of outside-facing storefronts. 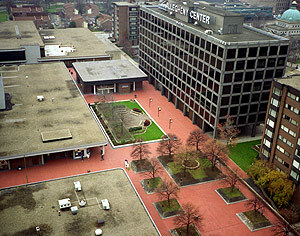 Allegheny Center’s original plan devoted much of its space to an open garden/park are on what is now just a bizarre gray plane. The center had mixed use as a central focus, accommodating retail, dining, office, and residential space. Parking is entirely hidden within underground garages. Maybe most surprising, given what we’ve seen of mall design since, nearly 100% of the exterior space contains big windows with views of downtown Pittsburgh (to the south) and up to the hills of Fineview (north). It’s also in amazingly great condition. I was struck by how absolutely clean and immaculately cared-for the entire property seems to be. Inside the mall, the arched atrium windows still let in a great slanted light, the original tile may show its age in color selection, but not in cracks or wear. Windows–there are many–are clean and bright. While it’s certainly dated, the architectural design has the remarkable quality of being both curved and boxy, regular and asymmetric, retro and modern. By today’s standards, it’s cool…or, at least, it could be. By any yardstick, it’s got a lot more potential than Century III. Let’s all cross our fingers for Nova Place. * This is only a slight exaggeration–during our half-hour visit we did see one dog-walker (outside) and one security officer (inside). 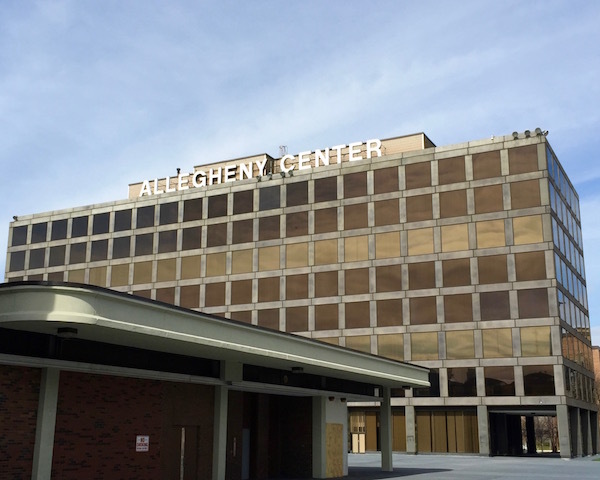 Developer plans to turn North Side’s Allegheny Center into technology hub, Pittsburgh Post-Gazette, May 21, 2015. The Science of Slim: Polymer-Modified Toppings, concretedecor.net, Nov. 2008.